We received the cover. Very nice. Perfect fit. Good price. We will be sure to pass your company name on. 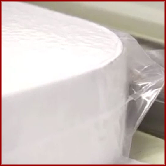 Why our spa cover is more Energy Efficient? 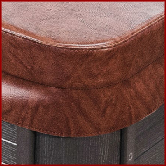 The continue corner skirt ensures no heat escape and maximum energy saving compared to other cheap covers on the market with a split skirt. This technology removes air from inside the wrap. 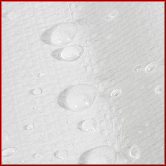 It's capable of keeping moisture off the foam and is the best protection for freezing damage in harsh Canadian winter. The moisture-resistant underside turns the steam back into the water. It prevents waterlogging cover and also enhances water saving. 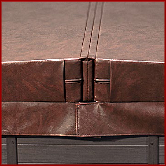 The hinge end pillow and overlap skirt flap are essential features to ensure minimum heat escape and maximize energy saving. Prices are CAD for cover up to 96"x 96". *Additional shipping charge may apply to rural and remote area. click for details. For sizes above 96" and custom shapes - please call 1-888-229-1325 or leave a message.